This past Monday was a wonderful day. How can it not be...it's my day off. And so on Monday morning, I headed over to my daughter Ani's house. She and her husband are hosting Thanksgiving again this year, for the third year in a row since they got married. This year we have something new to be thankful for! Little Arek, my grandson, is 12 weeks old this week. Can you believe that? And it's his first Thanksgiving...and our first Thanksgiving as grandparents. Each time I see him there is something new he's doing. This past Monday, while I was taking selfies of us together, he was getting a kick out of seeing himself on my phone screen, smiling at himself. So sweet. He tries to reach out and touch the screen, but his hand/eye coordination is not there yet, so he either overshoots it or doesn't quite make it, but it's very fun to watch him try. Not only did I get to play with Arek, but I got to help Ani with the Thanksgiving preparations. Growing up in Los Angeles, we were blessed to have my grandmother live nearby. In fact, she lived on the corner of our street and was always there for us while we were growing up. Always for Christmas and Easter, and any other special occasion, my grandma would make the yalanchi, the stuffed grapeleaves which were creamy smooth with their filling of rice, onion, pinenuts, currants, dill, allspice and cinnamon. She would call me over telling me she needed my help, but in retrospect I understand that what she was doing was teaching me how to soak the leaves, trim the stems, make the filling, roll the sarma. After my grandmother passed away, I took on the tradition of making her traditional recipe for family feasts. This week Ani called and said that she would like to take on that tradition for Thanksgiving. Isn't that cool? So Monday, we packed up Arek (his diaper bag, bottle, stroller, Mobi wrap, change of clothes, pacifier and blankie) and took a trip to the Armenian market to buy all the ingredients. After buying what we needed (along with a bag of chili mangos for the trip home - which we didn't need), we headed back to the house. I watched her follow my recipe to make the filling, and while it cooked, the two of us together stood at the sink, trimming the little stems from the leaves we had been soaking in water, setting aside the torn leaves to line the pan, just like my grandmother taught me. It was such a beautiful revelation to see how full circle I had come. 1. Being employed by a company that offers me full health benefits. I have been on the flip side of that coin, and let me tell you, my stress levels are so much lessened because I have health insurance. 2. My caregivers...the team of doctors and nurses that help maintain my health including my primary, oncologist, gastroenterologist, orthopedist, and all their nurses. 3. Family traditions that help us remember the past and how we got here. 5. The abundance that we so easily take for granted. Just look around. 6. Old friends - the kind that understand how busy my life is and so when I do end up seeing them, it's like no time went by in between visits. 8. Time spent with my mom discussing her past, childhood stories, and days gone by. 10. Early morning appointments that leave the rest of my day open to do things I need to do. 12. My glasses. I never really thought about it, but I rely on them to see. Life without them would be a blur. These are some of the items that made it on to my Gratitude list. What about you? Did you give it a try? Tell you what, try to make it a point this Thanksgiving, and all year, to be thankful not only for the beautiful family, friendships and love that we're surrounded with, but also for the little things that bring so much flavor and joy to our lives. A couple mornings ago, a friend had posted a video on Facebook about Empathy vs. Sympathy. If you're friends with me on Facebook, you probably noticed that I shared it because I thought it was so good. The video brings into light our reactions to those who are struggling around us. Have you ever been in a situation where a friend shares with you about something they're going through. I'm talking about something tough/difficult. You want to help and be there for them...but you have absolutely no clue what to say because you've never been there/done that. So you go into this mode of trying to make their situation seem not so bad, or silver-line their cloud. I loved what the narrator of the video says, "Rarely can a response make something better. What makes it better is connection." It's true, right? When your friend shares their pain with you, they're not looking for a solution. What they are doing is just sharing. They need an outlet. And there's really nothing you can do to make the situation better other than pray for them, of course, but what you CAN do is just be there for your friend. In order to CONNECT with your friend or family member though, you have to find that emotion inside of your self and share that in that feeling letting them know you understand and that you're there for them. I started thinking about this concerning two things. The first of these is our In His Shoes homeless outreach. Why are we so successful in reaching out to those in need? Our program has been ongoing for the past 6 or 7 years. I think the key is this empathetic response. Putting ourselves in the shoes of others who are suffering We're not just there handing out food. We are there to listen, to hug, to show love and compassion. To give them their dignity back. To care. And we do this because we too have been there. We explain quite often that we understand what they are going through because we ourselves, as an Armenian people, have been hungry, homeless, naked, afraid. We're there to help. It's entirely nonjudgemental but more of a change of our perspective and also in their perspective of how we are perceived. When they understand that we have walked in their shoes, we are suddenly not offering a hand out as much as a hand up. We can use this response when dealing with illness as well. I know this one really well. I remember when I was diagnosed with cancer. It's difficult. It was tough for me, but it's also difficult for the friend or family member that is trying to say the right thing. I mean, you have cancer. What can someone possibly say to you that will make you feel better. A positive diagnosis wreaks it's havoc in your head. Am I going to survive? Am I going to die? Who will raise my children? What if it comes back? In those dark days, what helped the most were the friends and family that had no idea what to say at all (because really, what can you say?) If you can just imagine yourself in that position and how terrifying it is, you can call up an emotion within yourself to walk in that person's shoes. And then just be there with them. Don't try to make the situation better. It's okay to say that you don't know what to say, or that you wish you knew what to do, but you don't...and then just be present for them. 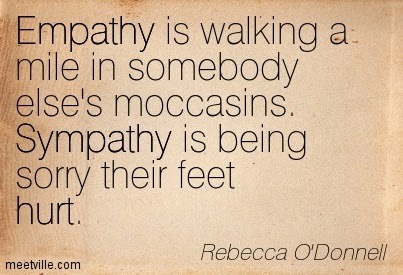 Empathy is feeling with someone. Sharing what they're going through. Sympathy is the detached, version of that. Christ was empathetic to humanity. He didn't sit back and feel sorry for the sick, the hungry, the poor. He brought himself to them, walked with them, held them, and He is still there for us in our time of need. To those of us who believe, we are never alone in our suffering. I've posted the video here. I'd love to hear what you think of it, so please feel free to shoot me an email or leave a comment. Tomorrow is Thanksgiving. On Thursday, most all of us here in the states will be gathering together with family and friends to give thanks for all we have. I was thinking about it today. How cool is that? That our country has a day where we're supposed to stop everything and come together and be grateful for our lives, and those we share it with. For some though, it's a difficult day as well. While the Norman Rockwell painting shows the perfect family sitting down to the turkey dinner, not all families are loving. Not all families get along. If this is the case, the day may be filled with trepidation or fear of confrontation. Or maybe you do have a great relationship with those in your family, but you have a tough time with all the food. If you've struggled with weight issues, like me, this day and its food, it's easy to self sabotage. So for those of you that are walking in MY shoes, I just want to invite you to take a step back this Thanksgiving, and make yourself "present". Pause. Breathe. Remember that it's not what's on the table, but who's around it. Tell your family how much you love them. Hug your Auntie Zabelle. Listen about Keri Hagop's trip to Chermoog...yet again. Enjoy the day, not for the food, but for the beauty of family, togetherness, love, and happiness. Savor your food but be mindful while eating - tasting every bite that was prepared especially for you with love. Sounds good right? Above all, take some time to be still and think about all that you have been blessed with and give thanks. Wishing you all a very beautiful, blessed and Happy Thanksgiving! Catching Up....Has it really been Six Months?